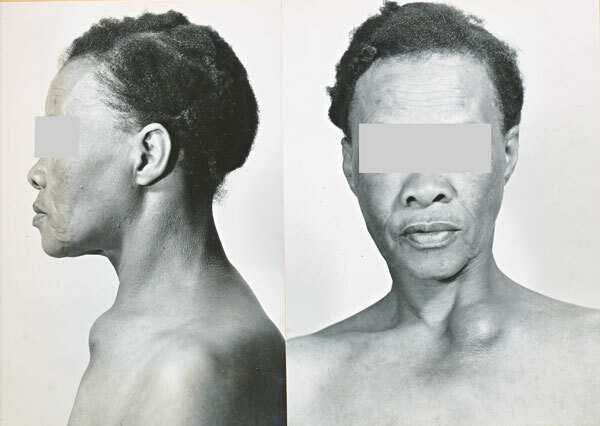 Home > Exhibitions > Classic cases of tuberculosis > Cervical tuberculous lymphadenitis "scrofula"
Lymphadenitis is the commonest form of extrapulmonary tuberculosis, and can be cervical, inguinal, axillary mesenteric or mediastinal. In HIV-negative persons it is usually unilateral and cervical in location. In person with AIDS it is almost always multifocal and associated with systemic symptoms such as fever and weight loss. The nodes are initially discrete firm and non-tender, later becoming a firm matted mass, and finally fluctuant with spontaneous drainage and sinus formation. Mycobacteria other than M. tuberculosis may be responsible e.g. M. scrofulaceum, M. avium intracellulare complex. Patient with a tuberculous gland at a common site - overlying the sternocleidomastoid muscle. 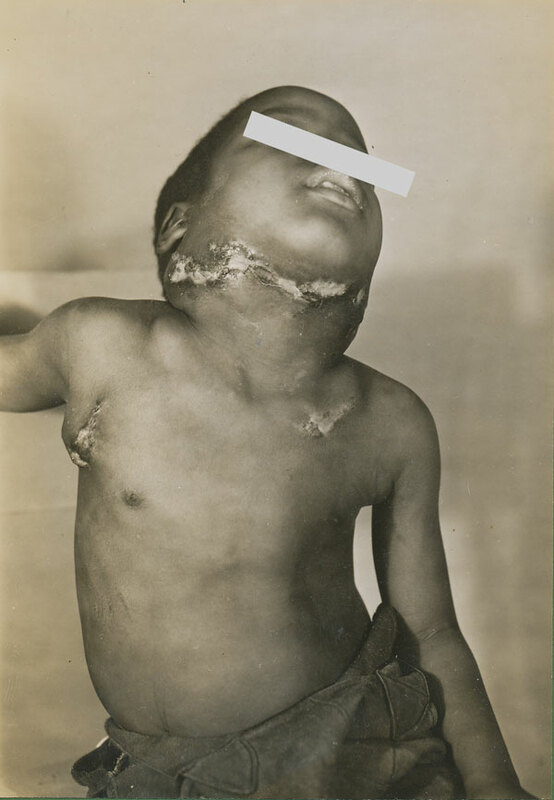 In this 4 year old child the cervical, supraclavicular and axillary nodes are visibly involved. The overlying skin has become adherent and has ruptured - this is termed scrofuloderma. In the middle ages, it was believed that scrofula (amongst other things) could be cured by the touch of an English or French sovereign. This touching practice began with King Edward the Confessor in England (10034-1066) and Philip I (1052-1108) in France, and only died out more than 700 years later. 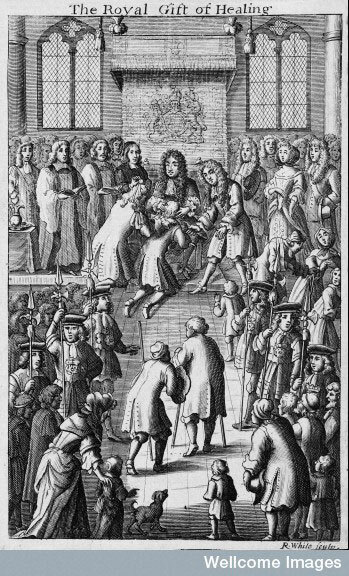 Kings touched thousands of people afflicted by scrofula during special ceremonies. Sufferers might also receive especially touched coins to be worn as amulets or charms.